Michael Mulgrew—says we have a lot to do today. Wants to discuss work union has to do and how we’ve done it. Says we’ve always been passionate, tough, and that intelligence in strategies have caused us to grow. Also wants to talk about tests. Seems disorganized. Speaks of how he resisted working for union, was too important for him. Was intrigued by offer of going to Albany and discussing NCLB. Mulgrew calls himself a ferocious reader. Said the good thing about NCLB was that it disaggregates students by different categories. Said it was good that it talked about how children were achieving, and how it focused on achievement gap. Said results would become yearly testing, would punish teachers of the neediest, and that he anticipated this problem. Mulgrew said he recognized that ESEA money would be deprived from schools who didn’t follow programs. He says he anticipated school closings. Said it would discourage teachers of high needs kids and that he argued a lot about it because that’s what he does. He walks around and argues with people. He was told GW wouldn’t be reelected and lost faith in politics. Mulgrew speaks of Obama’s new plan to avert all schools failing under NCLB, offered waivers. Race to the Top. Said GOP and Dems all said NCLB was awful but other side prevented reason. Mulgrew speaks of groups that want to privatize and destroy union, groups that don’t want public ed. to work. Mentions bad rollout of CCSS. Says he predicted issues with CCSS. Says not hard to figure out when you see this and you are an educator. Calls Bloomberg a liar. Says he stood up and called him that when people told him not to. Speaks of rest of state, with eval. before ours, having large capacities of bad ratings. Says they had formulas that placed their members at risk. Says he was warned not to use 100 point system, but he couldn’t prevent it because pols likened it to student tests. Says we did what was best year one, making sure people would not be harmed, had lowest % of bad ratings in state. Says state ed. dept. didn’t look good when all the kids failed test, so state simply adjusted dial ,made for better teacher ratings. Says we are going through an evolution in education that will not stop this year. Says we believe tests are not to be used for stakes. 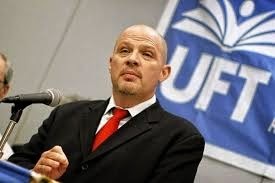 Says if UFT’s Frank Carruci were governor, we would still have test eval. because of federal funding. Says NYC receives largest title 1 funding in US. Says first and foremost issue was federal law, that we cannot stop any of this until we change it. Acknowledges Obama and Duncan made it worse. Says we may be able to change law because pols of both parties worry about elections, having gotten nothing done. Says ESEA may be where that happens. Randi took the lead and they worked with people, including Lamar Alexander. Says as they are negotiating with DC, they have Cuomo deciding despite bad rollout, massive frustration wants to increase use of tests, and that’s why we call him “Governor Genius.” Says Cuomo is getting just desserts, all of this will be blamed on him. However, standardized tests are the only thing recognized by feds, and if we don’t give them we will forfeit title 1, 2, and 3 funding. UFT got wording bipartisan agreement in Senate that feds will no longer mandate testing to be used in eval. in US. Mulgrew gets applause. Also got agreement there will be no mandate to close or turn them to charter schools. Says agreement says testing will be used only for measurement purposes, will require standards but won’t care which standards. Says ESL students will get three years before they are required to be tested in English, instead of one. Says nothing about this being a one-house bill. Says we wait for things to move in our direction, that bill is being fast-tracked. Says NY US Senators are on board and that in may be passed in May. This will be when we work on Congress. Says important that people who hate us didn’t know about this during construction, and that we always have to be smart about the work that we do. Asks that people thank Randi. This is the game-changer, he says. Mary Poppins would have to give test if governor. Recalls three major battles with Bloomberg trying to lay off teachers. Says we fought him back each and every time, including 400 million dollar cut, in which Christine Quinn was our partner. Says ESEA funding for us is 900 million and if we lost it, it would be catastrophic. Calls our fight with Cuomo successful in that his approval rating is down. Says we first had to get people on our side. Recalls Bloomberg’s precipitous drop in approval rating and says that’s why Klein was fired. Says he did us great favor with Cathie Black. Was great victory for UFT in that we did nothing. Says we had our strategies, worked hard, that approval rating is key. Mulgrew says individual merit pay is not there, but that it may be negotiated. Says that was always a right, but will not happen while he is leader. Says charters were pushed out of budget. Says tax credits pushed out. We made funding a major issue, and from outside it looks like we won, but state has continued with funding inequality. Says we got 20% more per kid but rich districts got 50% more per kid, and that this has worsened inequality. Says he told clergy this may result in legal action. We have largest % of needy kids and ed. should be based on need. Says we halted Cuomo’s receivership plan for scores of schools. Says “out of time” schools have one year to show progress, others have two years. Says legislature should not determined proper growth, and that they have pushed this to NYSED and Regents. Says we know the law, and no matter what NYSED does, must be approved by Regents. We have worked two years to shift Regents to board of educators. We are now comfortable to push things to SED with Regents oversight. Says they will not be dictated to by SED. On teacher eval, gov wanted 50% test scores, we wanted removal of 100 point test scores. Says he wanted to remove anomalies. When some areas were effective and others were not. Says he pushed everything to SED to avoid legislature, and now former teachers will do it. Says this will require a lot of work with Regents, including public meetings. Says Cuomo’s ed. rating rivals Bloomberg’s, says we achieved our goal of public support, that opt-out is a public choice. Says feds clearly have authority to remove ESEA funding from districts that don’t have 95% participation rate, that there is no waver. Says we receive a lot of ESEA funding and that we have business smarts. Parents should opt out, we need better tests, not Pearson, teachers should design tests, he says. Says ratings depend on SED and their magic dial. As result we have no idea how much kids are achieving. No one knows what, if anything tests mean. Says after these tests we still need to assess kids to know where they are, and that we are therefore moving toward federal regulation. We want state to be in control, he says, and to work toward what we know. Says it is tough because there is so much anger. Says he is not tester, but project based learning teacher. Refers to Cuomo saying kids fail and teachers didn’t that it was nonsense. Says Cuomo asked what industry evaluates itself, and Mulgrew says every industry. Says Cuomo thought admin was unfairly biased toward us. Says we will negotiate with SED, that there is a lot of leeway despite what people say. Says everyone said everyone would be rated poorly, and that didn’t happen, but that we must be ready for change because there will be multiple changes. Says SED may or may not mitigate, but that there are no percentages, that we have to get used to evolution of education and teacher eval. Says we have lowest number of poorly rated teachers and that people said here the world was ending. Says we understand a teacher is 10% of what a child achieves, and we are at war with those who ignore other 90%. Says he doesn’t know if he should go to the matrix, the box. Makes joke about e-i-e-i-o. Is hilarious. Speaks of school in which teachers rated poorly, but were rated high on student test scores. Ridicules good old days when principal completely controlled eval, and says with box student achievement can trump principal’s judgment. Says it’s not 50-50 because high grades take precedence over low ones. Shows box. Looks like Sudoko. Says there is less possibility of poor rating, and that student achievement can trump principal judgment, and principal judgment can trump bad achievement. Says we are starting to understand it. Says many letters. I-I becomes popular. Says 80% NYC teachers were effective in testing before a single observation. Says we are not gaming system. Says if he talks about it too much that people will say we are gaming system. Says purpose of eval. is growth, development and support, but people focus too much on these things. Says eval. system should be constructive professional practice and that he did enough on the box. Says test scores could only be negative, but now they can save people. Oddly, I’ve been in UFT meetings where reps said the same of the last system, the one Mulgrew says this improves on. Says he’s sorry he did all of this, but that everyone should have this info. Says we are most important local in country, but that we have more on our shoulders than any other, that we will win or lose the fight for public ed. Says if renewal schools improve, we win the war. Says if we don’t win, it’s all up for grabs. Says we have to do our business smart, again. Says our predecessors were always three steps ahead. Says what happened in last few days will help us to beat up governor, but none of it matters if we don’t move our school system. Says ESEA funding is important, and that people don’t want mayor and teachers working together, that we are their biggest fear because we may succeed. Says 73 schools want to enter PROSE program, in addition to 62 there. Says this will be significant, thanks people who contributed. Thanks those who worked on renewal schools. Thanks teachers who proctored NYSESLAT with no help for SED on new exam they didn’t know. Says we need to make sure we are smart, that we always need to be smart. Says we have more battles. Asks us to focus on moving our profession to a better place and that NYC will show how educators move things the right way. Says May brings 3% raise. Gets applause. Leroy Barr—please fill out teacher surveys. Encourages support, participation in rally for $15 minimum wage. Says CL elections should be in May, that it’s easier. Anyone in school first Monday can run and nominate, including ATRS. Next DA May 20th. Questions—what about CFE? Mulgrew says if it’s up to him, he will go to court. Says CFE establishes formula based on need. Says we will vote on whether to go to court. Charters are not backfilling. What are we doing to tell people? Mulgrew happy NYT reported on Moskowitz. Says all that info is given to press constantly. Battle on charters is now, he says, and getting it pushed out of budget was victory. Says need language would have fined charters. Says we have a charter division and that there are unionized charters. Says if we have to pay for their space why do they have 14 kids in room while we have 28 or whatever? Says Eva must have been disappointed. NYSESLAT, CL says training gave much info, but no exemplars or practice test. What can we do to help kids? Mulgrew—it was joint training because they would be ashamed if we held it alone. There is no practice test because they are unprepared. Says educators would know better. We are moving on getting that done, he says. Our ESL population is exploding. Says there is special teacher training program. Will produce 30 teachers but we need 3,000. Says problems are ELLs and space. Eval—says there was grace period where things didn’t count, and wonders will there be one on new one? Mulgrew says we have had two, will have third next year, not good educational policy. Says we need flexibility. Makes wisecrack about how what he says will be out on a blog and probably is already. Speaks of possibility of peer eval, says it is in law. Resolution—Evelyn de Jesus—that Regents hold public hearings on teacher eval.—placed on this month’s agenda overwhelmingly. Motion it be moved to number two. Passed. Resolution 1—Janella Hinds rises to speak in favor of proper use of assessments, system all students need, that uses variety of assessments, that are fair, developmentally appropriate. This is UFT testing res. Jonathan Halabi offers amendment about multiple measures, moves phrase “to evaluate teachers and gauge success of schools” be stricken. Says student tests should not rate teachers or schools. Other amendment—change “standardized” assessments to “state-mandated” assessments.Says word “standardized” enables Pearson, and that said tests are discriminatory. Says tests trick kids by using language they’ve never seen before. Says diagnostic tests must be built by teachers and used meaningfully. Says immediate feedback is crucial. Marjorie Stamberg—against all educational principles to use test for students to evaluate teachers, says we should come out against CCSS, Mulgrew stops her. Mulgrew says he gets in trouble for this and must therefore ask whether anyone will speak against amendments. Motion to table—second—motion not tabled. Francesca Gomes—raises opposition to resolution, as it validates standardized testing. Says if people are in fear of us, why are we asking for tiny insufficient changes, that they won’t protect good teachers against bad admin. Says standardized testing will always be a bad system, and that we should not validate tests. Says NAACP Prez in Seattle opposes them and says that opt out movement is important. Supports opt-out, Mulgrew rules her out of order. Mulgrew says now that there has been speaker against, time to call the motion. Amendment to remove “standardized” passes. Amendment to change multiple measures passes. Motion to extend 5 minutes. Passes. Mulgrew says we only have 2 left. Reso for public hearings Passes.